One of the tough things I'm having a tough time learning in Photoshop is Layer Masks. Seriously what the heck? Black conceals? White reveals? I think I'm finally starting to get it and this is one of my first attempts. I follow several blogs and one that I occasionally read is called MCP Actions and I watched this video which helps explain it. So you're probably wondering how they heck did I use layer masks in this photo? Well I went down to Alki (I'm starting to realize I got there a lot for photos) and wanted to try a fun shot with the Statue of Liberty in foreground and the Space Needle in the background. Again this is what I mean about trying to find the fun shot that others might not think of like I mentioned in a previous post. The problem with this photo is that no matter how small of an aperture I chose I couldn't get both the Space Needle and the Statue of Liberty as sharp as I wanted. So what I did was took two photos. 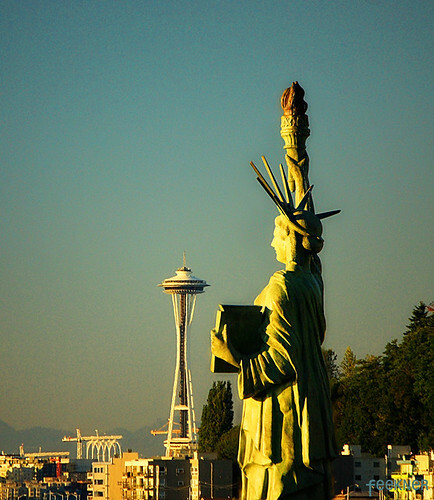 One photo was focused on the Space Needle while the other photo was focused on the Statue of Liberty. In Photoshop I was able to use layer masks to punch through one photo to bring out the sharpness of both. Pretend you printed both photos out and laid them on top of each other. With the photo on top you cut a hole out of the Statue of Liberty in the photo where the background and Space Needle are in focus and laid it back down. The hole that you cut out will allow the "in focus" Statue of Liberty be revealed in the bottom picture. Make sense? I still struggle with this and trying to figure out which layer goes on top. Very frustrating but I'm excited to keep learning! Here is the result! Check out my flickr page here!